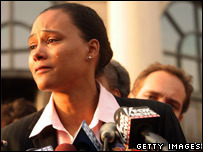 US athlete Marion Jones has pleaded guilty to lying about her steroid use to US investigators, which could see her jailed and stripped of her medals. The 31-year-old had previously denied using performance-enhancing drugs ahead of the 2000 Sydney Olympics, where she won five medals - three of them gold. In court she admitted using a steroid between September 2000 and July 2001, and lying to a federal inquiry in 2003. After leaving court a tearful Ms Jones said she was retiring from athletics. "It is with a great amount of shame that I stand before you and tell you that I have betrayed your trust," Ms Jones said after Friday's court hearing. "Because of my actions I am retiring from the sport of track and field, a sport which I deeply love," she said, admitting she had broken the trust of her fans. Ms Jones said she was told by her former coach Trevor Graham that she was taking flaxseed oil, a nutritional supplement, when it was actually a steroid known as "the clear". "By November 2003, I realised he was giving me performance-enhancing drugs," she told the judge at court in New York. She was ordered to return to court on 11 January for sentencing. Ms Jones also pleaded guilty to lying to federal investigators about a separate cheque fraud case involving her former boyfriend, sprinter Tim Montgomery. "The clear" is a banned drug linked to the Bay Area Laboratory Co-operative (Balco), a San Francisco-based laboratory at the centre of a steroids scandal in professional sports. The International Olympic Committee (IOC) launched an investigation in December 2004 into doping allegations involving Ms Jones in connection with Balco. Its another nail in the coffin of track & field athletics. I bet for every convicted athlete there are five getting away with it. The IOC said on Friday that it would step up its inquiry and move quickly to strip Ms Jones of her medals. The chairman of the US Olympic Committee, Peter Ueberroth, urged Ms Jones to voluntarily return her medals from the Sydney Olympics, in order to "properly acknowledge the efforts of the vast majority of athletes who choose to compete clean". Her court appearance comes a day after the Washington Post reported she had sent letters to family and friends apologising for drug use. "I want to apologise for all of this," the Post quoted her letter as saying. "I am sorry for disappointing you all in so many ways." The sprinter failed one blood test last year but was cleared of doping when a second test for the blood-booster erythropoietin (EPO) proved negative.